The content of this article might not reflect the view of others in my organization WhyHunger and the US Food Sovereignty Alliance (USFSA). I thank TNF for the opportunity to share my views based on what I experience as part of the USFSA’s Secretariat. 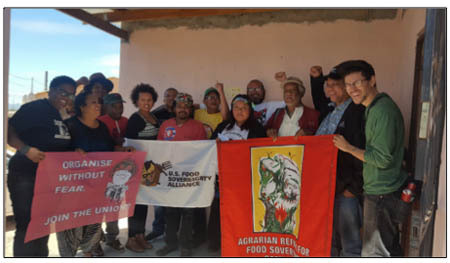 The US Food Sovereignty Alliance (USFSA) emerged from a global process initiated during the International Forum on Food Sovereignty: Nyeleni 2007 in Mali. From that gathering, organized by the La Via Campesina International and other global social movements, the idea of creating an alliance of rural and urban-based organizations in the United States was born. The US Food Sovereignty Alliance, as part of a global strategy, has been built over a period of eight years to build power and to move a political agenda led by small scale food producers, as well as groups that contribute to the food chain that makes up our food system. The same process took roots in other countries and regions and currently, there are four other similar spaces: the Australia Food Sovereignty Alliance; the Latin American Food Sovereignty Alliance; the Alliance for Food Sovereignty in Africa; and, the Nyeleni Pan-European Forum. The organizing of the USFSA was grounded in the relationships and processes led by grassroots organizations and grassroots support organizations. The first iteration was the creation of the Global Food Crisis Working Group to influence agriculture and food policies in the Obama administration. The USFSA, as it is today, was established a few years later at the 2010 United States Social Forum in Detroit, Michigan and then officially launched in New Orleans. Born through a People’s Movement Assembly on Food Sovereignty, the idea of the USFSA was shaped with the participation of several members of La Via Campesina International from Palestine, Haiti and Honduras, reinforcing the idea that it is a process grounded in grassroots internationalism. At the forum in Mali, participants reaffirmed that the fast-paced consolidation of international agribusinesses, supported by Global North governments, required a broadening reach of rural social movements. In that perspective, building unity in the diversity of ideas and struggles and a stronger connection between rural and urban people were necessary steps to achieve food sovereignty. Another point raised in Mali was the need to strengthen organizing in Europe and the U.S. – two areas in advance stages of consolidation of the agricultural sector and whose governments have great influence in food and agriculture policies that further agribusinesses around the world. Therefore, the creation of the US Food Sovereignty Alliance was a critical piece in the strategy of building power at a global scale. The building of the US Food Sovereignty Alliance, as a viable political space, continues to evolve. More recently, at its 2015 National Assembly, the USFSA decided to implement a new organizational structure to put grassroots leaders more firmly in the driver’s seat, to grow membership and to streamline its work through defined roles among its members. Four regional caucuses were formed: Southeast, Northeast, Mid-West and Pacific Northwest. Each region has elected two grassroots leaders to serve as coordinators and to represent them at the national level. The USFSA’s National Coordination body is now comprised by the regional coordinators, working team coordinators and the secretariat. With the new structure in place, the USFSA is currently organizing four regional assemblies that will undertake a process to develop shared political analysis and shape the USFSA’s agenda. The regional assemblies will culminate in the IV National Assembly in October 2018 that will define a political agenda, set multi-year goals, and outline a strategy to enact them. The Agroecology Research Action Collective (ARC): Formed by ally scholars from universities in the US and Canada, the Agroecology Research Action Collective is working with the USFSA to provide technical and logistical support for grassroots organizations. ARC’s Science Shop will receive research questions from grassroots organizations and plan participatory research projects in coordination with the USFSA. Closing the Hunger Gap (CtHG): Formed by progressive food banks and food pantries in the US, Closing the Hunger Gap is working with the USFSA to build a shared analysis around food sovereignty and the Right to Food in the United States. The USFSA is also lending its knowledge and experience to Closing the Hunger Gap as CtHG builds a regional and national coordination space for emergency food providers in the US focusing on dismantling racism and power inequalities. The Climate Justice Alliance (CJA): created in 2013, the Climate Justice Alliance gathers over 60 organizations nation-wide around principles and goals for a Justice Transition. CJA has played a critical role to include the voices of frontline communities in the debate around climate change as well as support the leadership of local communities in the building of real solutions to this environmental crisis. Food Systems New England: A regional network dedicated to better food and agriculture policies in New England, Food Systems New England is interested in joining forces with the USFSA and the Northeast regional body. Fish Locally Collaborative: An international network led by the Northwest Atlantic Marine Alliance (NAMA), the Fish Locally Collaborative is formed by scholars, fishing communities and grassroots support organizations. The USFSA’s regional assemblies bring together diverse members and allies to strengthen relationships, develop a shared political analysis and provide recommendations for the USFSA’s national agenda. These gatherings are not isolated events but coordinated, organizing processes to build power. With the new regional structure, the USFSA embarks in a nation-wide process of building a dialogue space AND a democratic process where different sectors can meet and develop common strategies. The expectation is that these gatherings will serve as spaces for political education and communication channelling with other existing alliances working to dismantle structural problems for the building of a more just food system. Currently, there are 42 members of the US Food Sovereignty Alliance, including the NOFA Interstate Council. For more information, visit the website at usfoodsovereigntyalliance.org. The USFSA is having its NE Regional Assembly in Amherst, MA on August 9th and 10th, thanks to the support of the Northeast Organic Farming Association (NOFA) and other regional alliances.